There’s a lot going on and we’re going to be part of it! In short, there’s a lot going on and we’re not part of it…yet! I’ve used the themes I mentioned in my last post to work out what we should focus on and prioritise. In total we have over 1,000 non–civic collections so over the next 2 years we need to target certain kinds of collections and create a plan to tackle the rest. Initially we’ll be focusing on York Charities & Voluntary Organisations of which we have 129 collections. 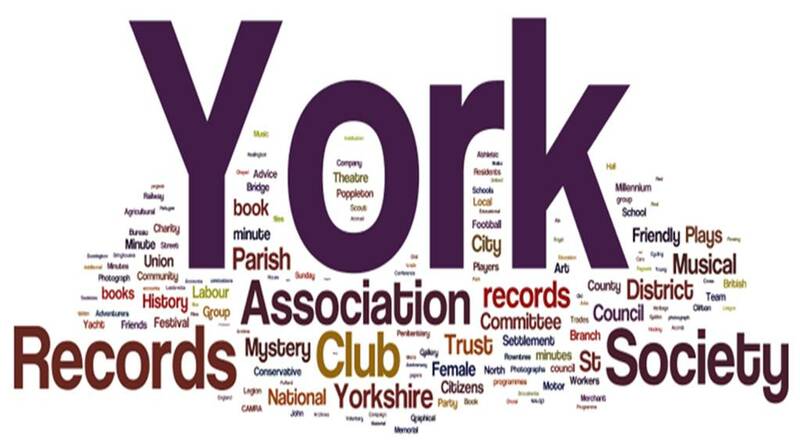 A Wordle is a great way to represent the kinds of charity & voluntary collections we hold in the non-civic archive! There’s also been a lot of progress in the scoping of current community activity across York, as we’re looking at how the service can represent the community as a whole through the collections and the public service we provide. 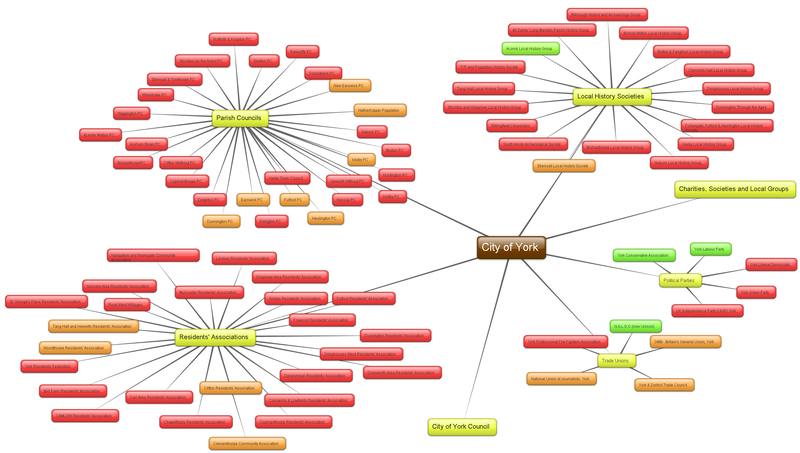 Most of the contacts have been recorded using Yortime.org, which is a hub for community events and adult learning created by City of York Council. Additional contacts have been provided by the City Archivist as a result of the Heritage Lottery Fund bid consultation process. I’ve also visually represented these categories and the groups within them using Bubble.us. Look Familiar? That’s because it’s the same mind mapping programme that Justine used for her project! Using a traffic light system I’ve been able to display visually the gaps in our collections, so we can see easily where we are strongest and weakest. I’m still working on creating a separate map for the Charities, Societies and Local groups but once complete it will be a high impact way to demonstrate our reach to support the statistics! Whilst creating these categories I became aware that most community groups fall into more than one category, for example York Carers Forum is a ‘Health & Wellbeing’, ‘Advice & Support’ as well as ‘social’ group. The group may also self-define themselves in another or entirely new category. So, we’re going to be looking at ways to get community groups to engage with us in ‘collaborative tagging’ where groups will have the opportunity to choose tags to describe their functions. The aim of this is to break down the artificial structure I’ve created whilst still making information easy to find. We’re keen to use the activity and it’s outcomes to support our engagement activities, collections development and to scope a platform for displaying community group information. So keep following us to see what we develop! The first 3 groups are known to hold their own archives and some groups have already expressed an interest in further advice and support on their archives, so it makes sense for us to engage with these proactive groups. The remaining groups may not have heard of or considered engaging with the archive service before, which means that there is fantastic potential to develop new relationships and to broaden access to York Explore. I’m really excited about finally getting out and meeting local groups, as it’s a very real way of getting to know the community landscape. From these meetings I’ll be finding more out about what groups do, about their history and records and also what they need from us before we start planning our workshops and resources to be delivered in 2015. Look out over the next couple of weeks for a post about our newly started volunteer project with Lord Deramore’s Primary School in Heslington!